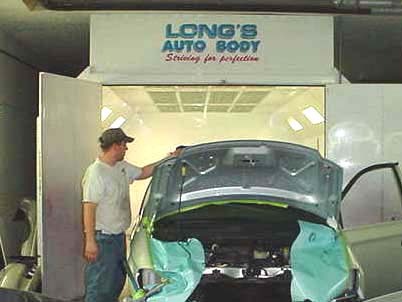 About Long's Auto Body Inc.paint shop, located in Fenelton PA.
Long's Auto Body's paint department has a JBI downdraft spay booth and Trisk bake system, we also use PPG refinish products to achieve a factory like finish on your vehicle. Our onsite paint mixing system with computerized scales enables us to mix just the right color to match your vehicle. The entire shop is plumbed with fresh air forced respirators and dustless air tools to ensure the continued health of our employees. Here at Long's Auto Body we also have a waste paint recycler to make sure that our environment will be protected from hazardous waste.